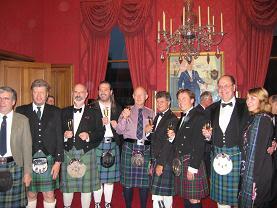 Almost 100 delegates met at the Douglas Hotel in Aberdeen from the 20th to the 23rd September 2006. Thanks have to go to David Bell and Ken Lawton for organizing a fantastic conference which included a comprehensive programme of social and scientific events. Soon after registration members enjoyed a welcoming buffet dinner which included haggis and tatties (potatoes) followed by a ceilidh. Other social events included a bus tour of Aberdeen as well as a choice of visits to Crathes, a baronial castle with famous gardens and almost unchanged since it was first built in the 16th century. Its glorious architecture reminiscent of the great French châteaux and the nearby ruined castle of Dunnottar an impressive ruined fortress dating from the 12th century, built on a cliff overhanging the North Sea. It was recently the scene of a modern film version of Hamlet featuring Mel Gibson. Delegates also experienced a choice of walking tours of the old city and a gala dinner held at the Town Hall with guest speaker Billy Kay who delighted everyone with the close associations between France and Scotland. Although most delegates left on the Saturday some members found time after the farewell lunch to visit Glenfiddich Distillery and sample the delights of this world famous whisky. Those who also stayed behind completed the day with a meal at the highly rated Nazma restaurant in the centre of Aberdeen. The scientific programme at the conference offered a wide range of informative presentations over the three days and the society passes on its thanks to those members who presented at the sessions. The 4 Miss Ford student presentations this year were of the highest standard. 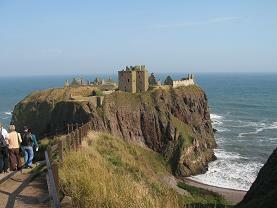 Dunnottar is a ruined castle on a rocky promontory where Scottish Crown Jewels were hidden from the English. Zeffereli filmed Hamlet here. Some walking involved – the castle is approximately half a mile from the car park.